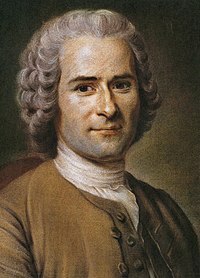 Jean-Jacques Rousseau (28 June 1712 – 2 July 1778) omo ilu Geneffa pataki amoye, olukowe, ati olusopo orin ti Iseromu orundun 18k. Imoye oloselu re ko pa gidigidi lori Ijidide Fransi, ati Ijidide Amerika ati lori gbogbo idagbasoke ero oloselu, oro-alawujo ati eko odeoni. ↑ "Jean-Jacques Rousseau > By Individual Philosopher > Philosophy". The Basics of Philosophy. Retrieved 2018-07-16. ↑ "Jean-Jacques Rousseau - Biography, Philosophy, Books, & Facts". Encyclopedia Britannica. 2018-06-28. Retrieved 2018-07-16. Àtunṣe ojúewé yi gbẹ̀yìn wáyé ni ọjọ́ 16 Oṣù Keje 2018, ni ago 12:49.